NE Campus hosted an information session to inform returning and new veteran students about resources that could assist them at school. 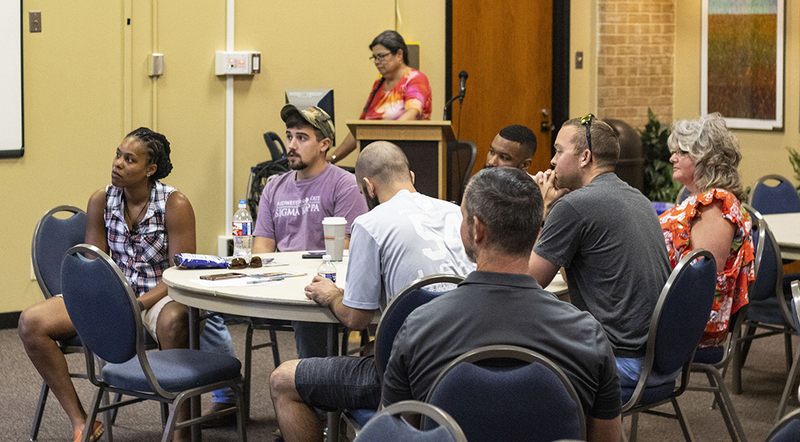 The Aug. 31 event kicked off with a networking lunch for veteran students who were connecting with others to form a support system. First-year NE student Joseph McDonough said he found the workshop helpful. He learned about different organizations that assist veterans and provide useful information. “There are all kinds of benefits that I didn’t know about, and learning that we have veteran-specific counselors also. I think it’s great,” he said. Guest speaker Keri Anne Wilcox with the Community Learning Center said the organization provides veterans services like home modifications to disabled veterans and financial assistance for veterans with car repairs or financial hardships. Student support coordinator Marjeanna Burge said since NE is the only campus in the district without a veterans success center, veterans are welcome to use her space in NLIB 2100 to grab a snack and unwind. Academic adviser Russell Cave said this workshop helps veterans not only to be successful at school but also to be successful at life. “I would like to see more veterans turn out for these events and more students be interested in these events,” he said. Veterans counselor Christopher Hunt said the material covered was helpful and the speeches were heartfelt. “Sitting down at a table and hearing someone say a few words helps build relationships, and I feel like that’s important to vets,” he said.